Grilled Vegetables makes a great healthy meal OR colourful starter – it’s like your own homemade vegetable antipasto, but it costs a fraction of what you pay at delis, tastes much better and it’s preservative free! Every time I make this, someone always asks “what did you put on the vegetables?” They never believe me when I say “Just salt, pepper and olive oil”! There is no fancy secret to this. 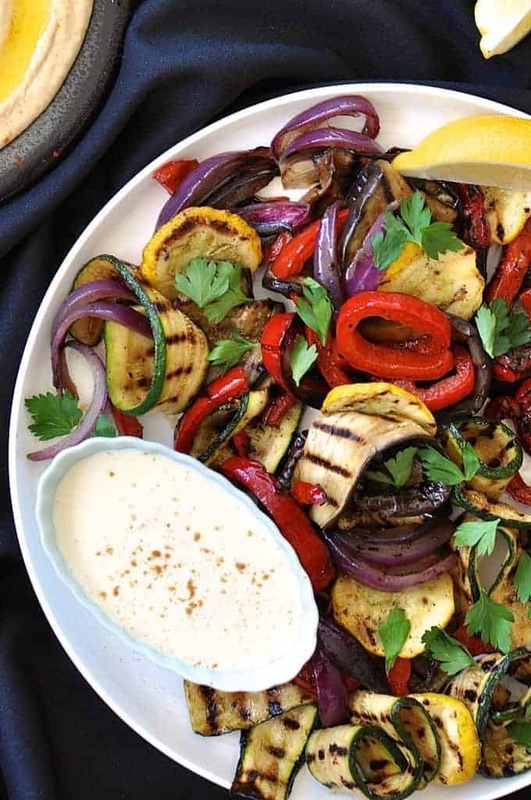 It’s just chargrilled vegetables, seasoned with salt and pepper and drizzled with olive oil. The “must do” part is cooking the vegetables until they are charred (i.e. burnt!). It’s the flavour base of this entire dish! As simple as this recipe is, what you may not know is that this is fabulous even if made the day before. In fact, I think it gets better because the vegetables sweat out juices overnight leaving a more intense flavour. It makes it taste even more like the vegetable antipasto that you can buy over the counter at delis, except the homemade version doesn’t have the vinegary flavour that commercial antipasto has which I think is to make it last longer. The mixed vegetable antipasto at the local deli costs around $25/kg which is far more than what it costs to make at home! 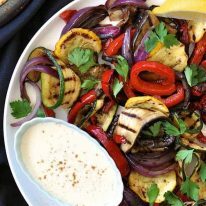 While these grilled vegetables are great as they are, sometimes I like to sprinkle over some fresh or dried herbs (after cooking it) and lemon zest for an extra special touch. I made this as an appetiser for an Arabian Feast I recently made. 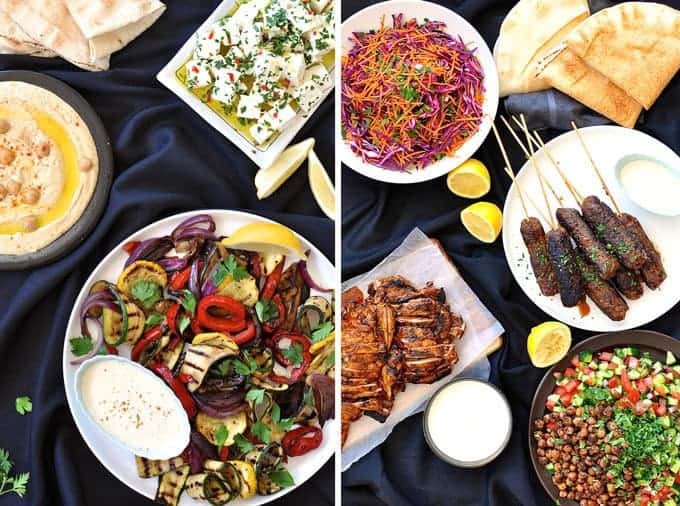 7 dishes that took 1 hour to prepare – 3 starters (including this Chargrilled Vegetable Platter), 2 meat dishes plus 2 salads. I’ll be doing a post on the menu soon but here’s a little preview for you! Here’s the post rounding up the full menu and explaining how to prepare it in 1 hour, how to store it and what needs to be done on the day. Spinach and Feta Gozleme or Vegetarian Quesadillas – great for cooking on BBQ’s! No Yeast Soft Flatbreads – try stuffing them with grilled veggies! This is like a homemade vegetable antipasto that costs a fraction of store bought, tastes better and you know is preservative free. Whether as a starter or a vegetarian main, this is one of those dishes that proves that simple is best. This recipe includes a Yoghurt Sauce which gives this a Middle Eastern touch. Use whatever vegetables you want, so long as they are suitable for grilling. Combine the Yoghurt Sauce ingredients in a bowl and mix. Set aside in the fridge until required. Heat the outdoor grill on high (hot plate side). Or a heavy based pan on the stove on high heat. Drizzle olive oil on the hot plate / fry pan. Place vegetables on the grill / fry pan and cook until charred (about 1 1/2 - 2 minutes). Turn over then cook the other side until charred (about 1 1/2 minutes). Don't worry if the vegetables are a bit undercooked, they will continue to cook while resting. Remove from the hot plate / fry pan and place in a bowl. Sprinkle the vegetables in the bowl with a pinch of salt and pepper. Repeat with remaining vegetables, and pile the vegetables on top of each other in the bowl. Don't forget to add a pinch of salt and pepper on each layer of vegetables. Cover and let it cool to room temperature. If you are making this ahead, place the vegetables in the refrigerator until required. Bring to room temperature before serving. To serve, place the vegetables on a platter, drizzle over olive oil (the more generous the better!) then garnish with parsley/coriander leaves and lemon wedges (if using). Place the yoghurt on the side (garnish with a pinch of cumin powder) and serve with flatbread or crusty bread. 1. This can also be served hot rather than at room temperature. 2. This is great made the day before. The vegetables sweat overnight so when you serve it, the vegetables aren't juicy. So it is even more like the antipasto you buy from delis. 3. I kept this very simple with just salt, pepper and olive oil. Sometimes I add a sprinkle of dried herbs, chili or spices. I also sometimes like to add lemon zest and/or lemon juice. 4. If you make this on the outdoor grill, not only do you get extra chargrilled flavour, you will be able to make this much faster because the hotplate is larger than fry pans. I can make this in 2 batches on my hotplate which means that if I serve it hot, it's on the table in 15 minutes! 5. 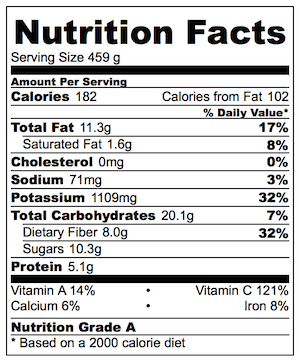 The Nutrition assumes 3 tbsp of olive oil is used. OMG! Nagi, these veggies are exceptional! So delicious. Didn’t think they will come out that good. Embarassed to say, but ate massive bowl all by myself. Without side sauce, simply didn’t need it. Added some mushrooms and worked really well. I’ve tried many recipies for baked veggies with all sorts of marinades to enhance the flavour, but cannot compare with this grilled bowl of goodness! I’m making this on Tuesday but am confused about the squash. In NZ it’s another name for some varieties of pumpkin but that doesnt seem right if I’m grilling it with all the other vegetables. Maybe if cut thin enough will cook too. Can you confirm please? I enjoyed this menu at a friends luncheon recently so copying her! It was delicious! Thank you! Hi Jo! Our squash is a small vegetable the shape of a pumpkin but it’s softer 🙂 Pumpkin will be fine too! Thinly sliced as you said. YUM! I’m hoping to prepare this feast in 3 days. If I were to prepare the veges in the morning and char grilled them on the BBQ or grill, what would be your advise as to how to successfully heat them in the evening? I was thinking I could whack them in a disposable aluminium container and reheat on the BBQ when the meat is cooking. We have friends visiting Brisbane from Edinburgh and wanted to make something special and exciting for them. Thanks Nagi, I appreciate your response and will follow your suggestion for room temperature. I’m sending MOTH and the visitors out for Saturday so I can concentrate on making the feast. OMG, made the chicken & peanut satay last night, what a ripper that was. This was worthy of a gold medal and yes room temperature is perfect. I whacked in other veges like asparagus, yellow capsicum, fresh green beans, corn, snow peas and used olive oil infused with lemon + fresh lemon to serve. The charring gives a really lovely flavour which is perfect with the lemon. The yoghurt sauce is used regularly at our place, made it for taco salad bowls last night. Made this along with your Chicken Shawarma recipe and put them in wraps; just amazingly tasty. I love that this recipe has opened my eyes to how tasty eggplant and zucchini can be and am excited to find ways to combine them into future meals. This week I will try and add the grilled eggplant and zucchini to your Nando’s Portuguese Chicken Burgers recipe; so excited for it. It all looks positively yummy and especially the yoghurt sauce! This looks fantastic! I love chargrilled veggies. Yum! I love your posts where you share the dishes for a complete meal in a series 🙂 Super helpful with party planning. The grilled zucchini is my favorite! Thanks Sarah!! The grilled vegetables are one of my favourite too. So simple, SO GOOD! Chargrilled vegetables would catch my eye first regardless of what else is on the menu. I love the smoky flavour and the sweetness of the vegetables when cooked this way. Just a hint of lemon juice is all I add. Yummo ! We’re two of a kind Maureen!! Simple veggies like this this are my favourite too 🙂 So delicious! Such a rainbow of colours. And I agree – homemade always tastes better than the deli version. Thanks Helen! The deli version is crazy expensive, isn’t it??!! Awesome Nagi! I love this salad, I sometimes add grilled mushrooms to it! Love the sauce, too! Isn’t it amazing that simple grilling (almost wanna say charring!) brings out amazing flavors? And they just need a little salt&pepper and a good olive oil. Mmm I can taste it! I know, it’s amazing, isn’t it!! It truly astonishes me. Especially with veggies. Meat not so much, I always feel like I need a sauce or some kind of seasoning!